The SPECTRUM deck is not a trick. It's a UNIQUE and BEAUTIFUL deck of cards which CAN be used in many magic effects. The SPECTRUM deck is the world's first and only TRUE Bicycle rainbow deck! What does that mean exactly? In 2001, Cosmo Solano had been performing a "rainbow deck" routine for years and always WISHED that he could LITERALLY change the color of the deck not the cards. (A TRUE color change wouldn't involve changing back design, JUST the color!) Changing the deck was a nice trick, but not MAGIC. The standard 54 cards (Jokers included) will make up a beautiful spectrum of colors. Plus two "gaffs" are included. The cards are manufactured by U.S. Playing Card Company, on highest quality stock with the "Magic Finish" (the preferred finish for professionals). 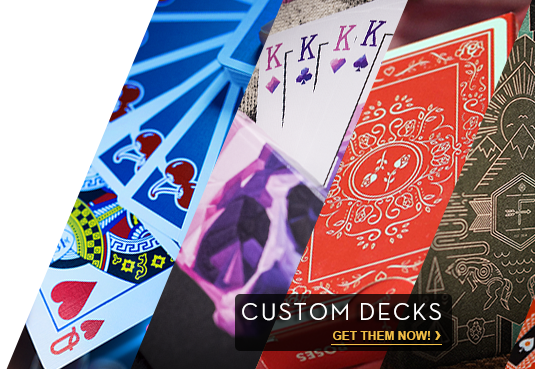 Custom Jokers and a custom Ace of Spades have been designed for this deck as well. The rest of the faces will be the classic, 808 Bicycle design and yes, there is a built in "reveal"! First of all, there's a reveal in the Guarantee Joker. Yes, Solano could have flooded the cards with reveals, but this deck really is awesome for color changing deck routines! Cosmo wanted to keep it simple to preserve the SPECTRUM deck's beauty. The cards will have something very "special" (for magicians) about the way they are packaged at the factory... In an effort to make a beautiful deck of cards that ALSO serves as a great magic prop Solano realized that the gradient color order of the cards (as shown in the card spread graphic above), shouldn't be when they're in new deck, (Ace through King) order. They should be in color order when the deck appears to be mixed. Cosmo has gone to the effort and extra expense to rearrange the order in which cards are printed at the factory, so that when you spread what appears to be a mixed up deck on the faces, the perfect spectrum is on the backs! When you get the deck they will "appear" to be mixed up already! But there's a secret order to them! (Just imagine Si Stebbins set the deck up for you at the factory... 'nuf said!) One more thing... The deck has been set up in a way that also allows you to give it a red back look or a blue back look, without messing up the spectrum. The Ace of Spade has the traditional blue back and falls right at the center of the deck. So whether you're a blue deck person or red, you can work this into your routines! Also no matter where you cut the deck the spectrum works. In other words, the bottom most card leads to the top card in the spectrum! And even if the cards are mixed up (not in the order you see in the graphics and videos) the deck STILL LOOKS AMAZING! Spectrum Tally Ho Deck by US Playing Card Co.